All roof faults should be attended to immediately they are noticed. If not, the damage to the fabric of the roof will rapidly get worse and worse, turning a minor repair into a major one. This is par­ticularly true for flat roofs. The waterproof covering is usually three layers of bituminous felt laid on the roof boarding. The first layer is attached with clout nails. The two subsequent layers are bonded to the one beneath using cither bitumastic (also called cold mastic and mastic bitumen) which is applied cold or a bitumen-based solid compound which has to be turned into a liquid by heating it before it can be applied. The bituminous material is poured on to the underlying felt and spread evenly. The second layer of felt is bedded into the bitumen compound, another layer of bitumen compound is applied and more felt. The compound hardens when it cools. All joints are over­lapped rather than butted and are arranged so that the joints in the layers do not coincide. A final covering of stone chippings is spread over the roof and bonded to the felt with a chipping compound. The chippings reflect solar rays which would otherwise cause the felt and bitumen to degrade and fail prematurely. The joint between the house wall and the roof is scaled with a flashing of fell mortared into the wall and stuck to the roof felt. If a felt-covered flat roof starts to leak, it could be an isolated problem with most of the roof still in good condition or it could be the first sign that the whole covering is on its last legs and will soon need replacing. 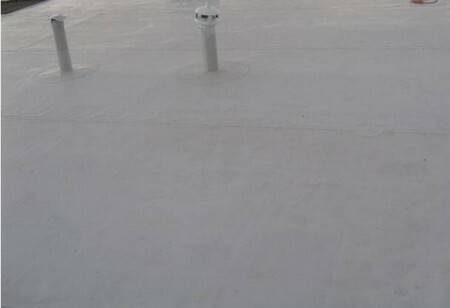 The first thing to do is to inspect the surface of the roof closely. It is often difficult to pinpoint the exact point of failure of a flat roof – any water which has penetrated the fell covering may have run some way along the roof timbers before finding its way between the joints in the boards and appearing on the ceiling below. If moisture has got beneath a section of the roof, the felt covering may have bubbled and burst through the action of heat expanding the moisture. In this case, a simple repair may be all that is needed cut the bubble and open it out to allow all the trapped moisture to evaporate. Brush a layer of cold bitumaslic compound on to the boards of the roof and then fold the edges of the bubble back into place and bed them into the compound. Spread a layer of bitumaslic compound over the surface and spread a layer of chippings on top of it. apply a waterproof covering all over the surface.